Creation of advanced inforgraphics is not the main use case Grapholite has been designed for, but still it's possible to create some sorts of infographics by using the application. This is facilitated by the presence of various shapes and arrows that can be used to show relationships and dependencies between information units. You can organize data in different ways, build hierarchies, use cycle diagrams and chevron arrows in your presentation. To complement the design, you can use Grapholite as a vector graphics editor. It should be noted that the infographics created by using Grapholite is scalable to any size without loss of quality due to the fact that it's originally the vector graphics. Here is an example infographic that was created using Grapholite. The infographic describes Grapholite application opportunities: what operating systems does it run on, what diagram types does it support out of the box. There are also some features highlighted that distinguish the program from others. 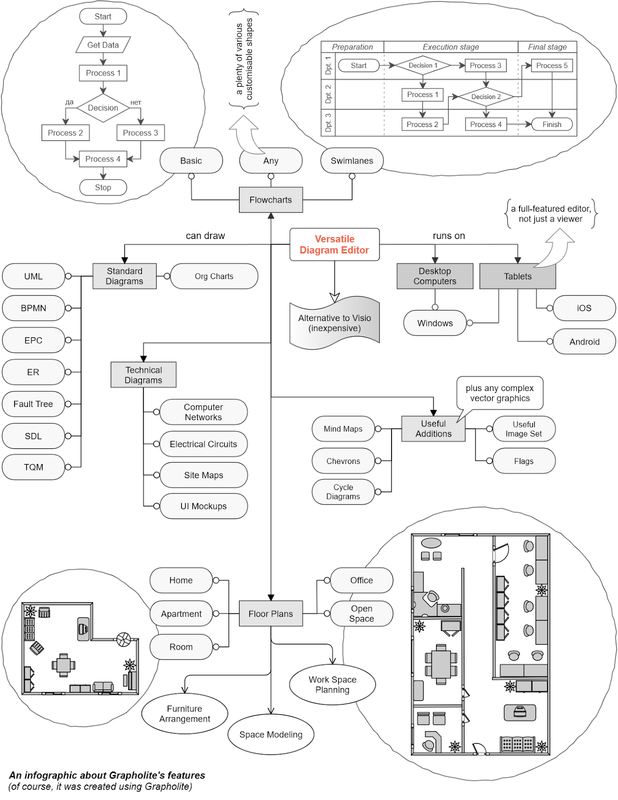 For greater clarity there were some diagrams from Grapholite's library "embedded" into the presentation, namely: sample flowchart, swimlanes, home and office floor plans.